Safety and security are major issues in the industry. There is a lot to protect, from passengers and staff to expensive assets. To get an insight into some of the latest equipment available to help, Chris Peat visited the IFSEC (International Fire and Security) exhibition at the ExCel Centre in London, a get together of various providers of security systems. Many exhibitors were showing CCTV equipment. One of the most relevant was Axis Communications, which had mobile camera systems on display. I was shown the Axis P3905-R network camera, which is dome shaped and designed to withstand the tough life of a transport environment. Recording in HD TV video quality, it adjusts to light conditions to ensure optimum quality is achieved no matter at what time or where it is being used. It has also been designed to be quick and easy to install, as well as vibration proof. The F Series from Axis was also on display. The F-44 in this range can have up to four channels plugged into it and its cameras come with a choice of standard, varifocal, fisheye and pinhole lenses. It has been designed to be heat resistant and records on a 128gb SD card. A representative on the stand claimed the way forward with CCTV are systems recording in IP quality rather than analogue. He said the European standard for CCTV (EN50132-7) cannot be met with analogue devices. 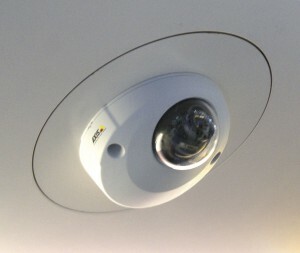 Genie had an onboard mobile CCTV application on show, its MVR400. The four channel CCTV system records at 100FPS and features built in GPS along with anti-shock and vibration control. Recording on a 250Gb memory card, it can also be used to record in real time, with phone apps available to view this footage. Samsung Techwin were at the show too. One product suitable for coach and bus applications was the SRM-872 digital video recorder (DVR). The company says this is public transport certified and has GPS capabilities, a motion sensor and ‘plug and play’ camera connections. Whilst in the surveillance camera section, I met Geoff Cross, MD of Central Buses and bus and coach CCTV provider, Centrad, who was attending to make sure he was up to date with the latest technology available in PCV surveillance. It was not just CCTV equipment that was relevant. There were a lot of stands from companies based in the Far East, including Hongdian, a wireless router supplier. The company provides a bus Wi-Fi router, which supports both 3G and 4G networks and can, optionally, have a GPS function. The business also provides a bus Wi-Fi platform for remotely monitoring vehicles’ router status, including online users, data flow and signal. It provides statistics on Wi-Fi user’s online behaviour and can be used to remotely update resources (films, messages, etc) on routers. Key management systems were another product type well represented at IFSEC. Amongst them was Morse Watchmans, which showed its KeyWatcher solution for managing, controlling, tracking and auditing keys. These scalable devices provide a secure container for keys. They include the KeyWatcher Touch with its touch screen interface that offers step by step instructions for the user, as well as the KeyWatcher Illuminated, which has light up key slots that are intended to make it easy to locate keys for which user is authorised. The systems provide control over who gets specific keys and records who took what and when. This year Keytracker were displaying examples of their key and asset management systems. 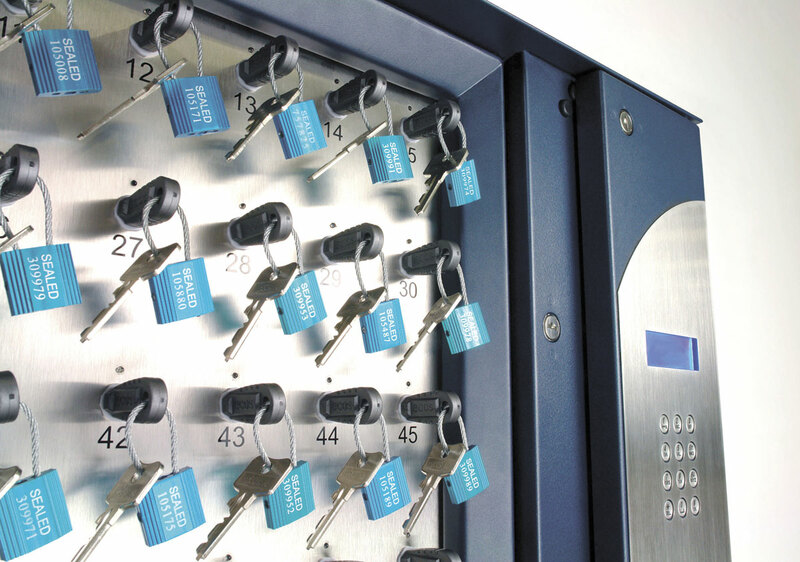 The Electronic Key Management Systems are designed to provide simple and efficient management of keys and assets, combining state of the art hardware alongside easy to use software. All contents secured in Keytracker’s Electronic Systems can be monitored using: complete audit trails, instant reports, alerts, restricted access and 24-hour support. There is also the added option of physically restricting the keys, to prevent unauthorised users from accessing them. The corresponding software is simplistic and can be networked into an existing server or stand-alone. Access to keys can be achieved by PIN, swipe card or biometric methods, any of which can be integrated into the system upon request. Assa Abloy displayed its key management system. The device has full control, monitoring and recording functions. It provides a fully audited history of key usage, which it says is easy to use and can be viewed on the company’s software reporting function. Keys, or keysets, are attached to a metal iFob using a tamper proof security seal. Each fob contains a chip, which gives it a unique identity, effectively making it electronically tagged. 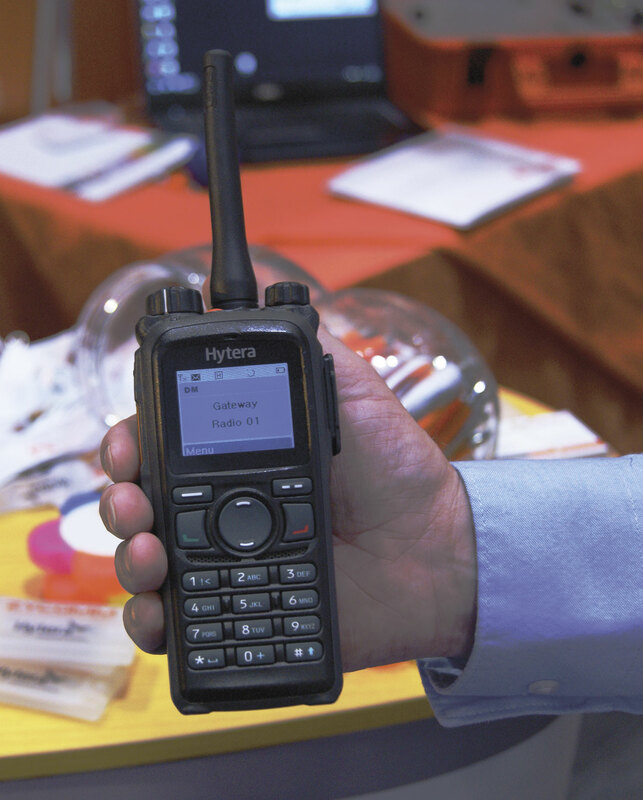 Two way radio systems were another common sight at IFSEC. Zycomm’s products were displayed and what the company said sets its wares apart from others on the market is the fact they can be integrated into a wider infrastructure in a depot or bus/coach network. Its products have GPS capabilities, enabling them to be used in a tracking system, combining radio communication. They can also be integrated with real time information systems. Another aspect of Zycomm’s products is a panic button, which records the driver’s location when they are in a potential difficulty. Not only can they be used to receive and transmit voice communications, they can also be used to give texts and e-mails, as well as Tweets. They can additionally be fitted with a function that opens gates and barriers when a button is pressed on the handset. Icom was displaying communication devices that work over wireless LAN and IP networks. It allows staff over an extended site, such as a depot, to communicate seamlessly. The company’s IP100H communication handset can be used for this, which has been designed to be compact in size and has a vibration alert function for incoming calls. Optionally, a headset can be used. Also available is the AP-90M wireless LAN access point and the IP1000C controls terminal for creating the network required for two way communication over Wi-Fi systems. Its LAN security protocols encrypt private conversations. 2CL Communications Ltd was promoting a range of two way radios. One of these was the SL4000 Series, a ‘sleek and smart’ product intended for business leaders. Suitable for use in the bus and coach industry is the SL1600, a slim, light weight radio. It has been designed to be rugged and simple to use, with a long battery life. It has a versatile range of carry options too, allowing the user to communicate using it while focusing on the job at hand. Displayed in the FireEx section of the trade show was Protectowire FireSystems’ linear heat detector. The cables detect heat anywhere along its length. These wires can be integrated into vehicle fire detection and suppression systems, in particular those used in engine bays. They are designed to survive severe environmental conditions, are approved for hazardous locations and should be easy to splice. Firetrace, who provide the fire suppression technology used in Forman Vehicle Service’s products, were represented. The product’s tubing is manufactured from specially processed polymer materials, which allow it to detect heat. The system discharges an extinguishant directly from the burst hole in the tube when a fire is detected, which should be the closest point to the flames. The devices do not require an external energy supply and as such do not require any electrical installation or wiring. They are designed to work even when contaminated with oil, dust and debris, as long as the contamination will allow heat to pass through to the tube. The product has been fitted on TfL buses. Visitors to tool company, DeWalt’s stand, could enter a competition to win a motorbike. One interesting product being shown was WebeyeSOS from Webeye CMS. The smartphone app for lone workers was said to have uses in the bus and coach market, for drivers, conductors or on street ticket sellers in particular. 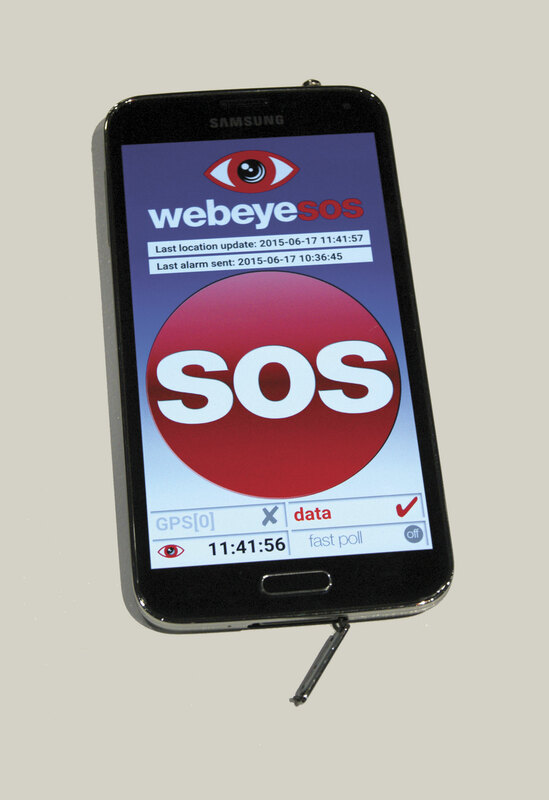 The app has a large, on-screen ‘SOS’ button, which once pressed will send an alert to whoever is registered to receive one. This is done by either e-mail or text. The sender’s phone covertly vibrates every 30 seconds to inform the worker the alert has been registered and back-up is on the way. Their location is also tracked every ten seconds for ten minutes, or longer if required. An array of colourful switches was shown by RJS Electronics Ltd, many of which can be used in bus and coach applications. IFSEC may not have been as obvious a show to attend for the bus and coach industry as the annual NEC events, but it does provide a good insight into products that are perhaps not as commonly seen as those at the aforementioned shows.